We have learned that it helps to shop thrift stores armed with knowledge. Here are a few tips that help us in our quest to find the best for less! Bring someone who appreciates the hobby or simply shop alone. Thrifting is not for the faint of heart and requires a great deal of patience. Find a reputable tailor who can make alterations to items you just have to have. A tailor goes a long way whether thrifting or not. Bring cash. Many thrift shops do not take credit cards and certainly not checks. Consider how the look could be changed to meet your needs and match your style. For example, a man's shirt can be worn as a dress or an oversize blazer can be belted. 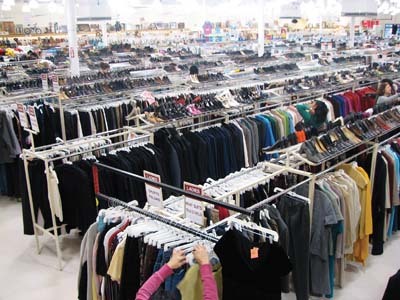 Know that a thrift store is not the mall. Go in without expectations and don't give up if you do not find specifically what you are looking for. To avoid getting overwhelmed and possibly buying too much, make a list of your wants and/or needs. Many stores do not have dressing rooms; therefore, wear leggings and a fitted top to try on clothes in the aisle. Visit stores in affluent areas. They generally have the best merchandise. Become a frequent shopper. Associates may become familiar with your style and point you in the direction of great finds. Dry clean or wash your finds on gentle cycle before placing them in your closet. This is important way to avoid bringing any contaminants from the previous owners home. Remember the accessories. Thrift stores are a great place to find silk scarves, vintage jewelry, and belts. Shop the label. Whether shopping for vintage pieces or high end brands, labels tell the story. Please share any tips that you have. We would love to hear from you! Great tips! I totally agree, it's NOT for the faint of heart. What I love about it is the thrill of the hunt! Great tip about trying on items in the aisle!! @Ashley I hate being rushed, so I prefer to shop alone. Because like you I enjoy the hunt and I don't want to miss my next big treasure!! What a great a tribute to your grandmother on your site. This shopping tips are really helpful for us and we can buy a best clothes in our budget. We should followed these all tips if we want to save money and want cheap clothes. THRIFTY THURSDAYS: Are You a Vintage Label Snob?